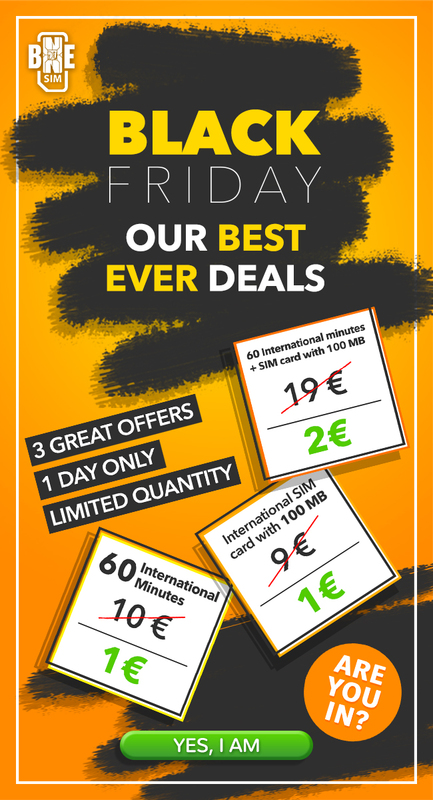 Black Friday 2018: 1 International SIM card 1€, 1 hour 1€! Every year on the Friday after Thanksgiving, businesses across the United States significantly discount their products and services. These discounts drive consumers out in droves, encouraging them to buy items for reduced prices both in stores and online. While many consumers know Black Friday can be the best time to purchase many big ticket items like televisions, video game systems, and laptops, some people do not realize that Black Friday also provides opportunities for people to travel on a budget. From discounted flight tickets and accommodations to reduced prices for international data SIM cards, Black Friday can help anyone travel without breaking the bank. If you are planning a trip to another country, you are going to need an affordable way to stay in touch with your friends and family while you are abroad. An international SIM card is the best way to use your phone overseas without racking up international roaming fees or worrying about unpredictable, unreliable service. With international SIM cards, you can pay-as-you-go for data and calls or texts without wasting time and money purchasing several local SIM cards or figuring out additional fees for different networks. One of the best ways to make sure you do not miss out on any Black Friday deals on international data SIM cards is to sign up for an email list. When you subscribe to the email list, you will get updates on Black Friday deals early so that you can plan for Black Friday accordingly. Some companies will even offer their email subscribers coupons on top of their Black Friday discounts. BNESIM, a leading international data SIM card provider, will offer a 10% off coupon for consumers who sign up for their email list, and they will reveal their Black Friday deals early for their email subscribers. Those who visit www.bnesim.com and join the email list will receive a sneak peek into BNESIM’s amazing Black Friday discounts on international data SIM cards. If you are interested in purchasing a discounted international data SIM card on Black Friday, you should sign up for company’s email lists so that you can always stay in the know. If you want to know about any Black Friday discounts on any item, you should check out any blogs or newsletters put out by a company. This same rule applies to finding discounts on international data SIM cards. Many businesses put out advertisement weeks in advance of Black Friday, and these newsletters let consumers know how much what prices they can expect to pay for international data SIM cards on Black Friday. BNESIM has a regularly updated blog that provides information about their best-selling international data SIM cards. These posts can give you all of the Black Friday information you need to know for you to plan your purchases. Following companies on social media is a great way to ensure you will stay updated on all of the company’s Black Friday deals. If an international data SIM card company has a social media account, they will likely use it to post about their Black Friday 2018 deals. Follow companies on Instagram, Twitter, or Facebook to stay in the loop this holiday season. For example, BNESIM recently tweeted their followers about their Black Friday international data SIM card deal. This tweet shows followers that BNESIM will offer deals for as little as one Euro, making sure they are prepared for Black Friday. 1) BNESIM Starter Pack for only 1€. This starter pack offers users 100 MB of 4G LTE Internet valid in 64 countries. With the BNESIM Starter Pack, your credit allowance never expires and you receive unlimited free incoming calls from any country in the world. 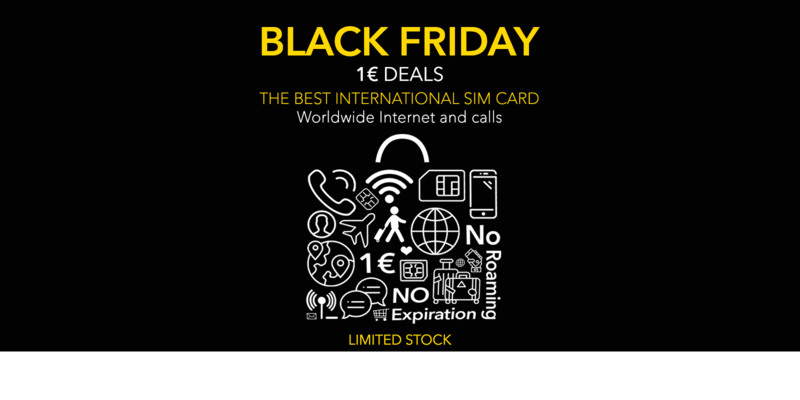 This international data SIM card, which is already a great deal at its original price of 9€, should not be missed at its 1€ price on Black Friday. 2) 60 minutes international calls for 1€. BNESIM will allow you to top up your minutes allowance for 1€ per hour. Download their app, visit the self care and grab this amazing deal now. 3) Starter Pack and 60 international minutes for 2€. This is a once-in-a-lifetime-deal, not only for the amazing price, but also because the SIM card included in the offer covers 88 countries! If you plan on travelling abroad any time soon, you should take advantage of these incredible Black Friday 2018 deals so you can save as much money as possible. For more information about BNESIM and our international data SIM card Black Friday deals, visit BNESIM.